Chlorophyll and Sea Surface Temperature data are provided from the SeaWiFS, MODIS and AVHRR sensors. Various images and formats are provided below. Note that Feb-Apr 2004 was reasonably cloudy in central California, so there are relatively few clear images for Morro Bay proper. 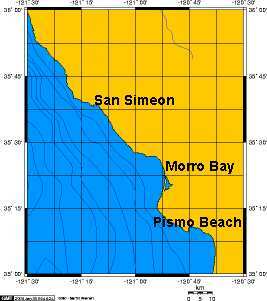 The first links are high-resolution imagery of Morro Bay, but are more subject to cloud problems. The next links provide a large area of central California. While not useful for identifying patterns in Morro Bay, they provide a view of the mesoscale oceanography.